Sunday morning started off with a call from Dad to say that Mum was not well and could I take her to the Doctor. To cut a very long story short, an ambulance was summonsed, and off she went to hospital. She has suffered a heart attack and is currently still in Oamaru Hospital but on the road to recovery. 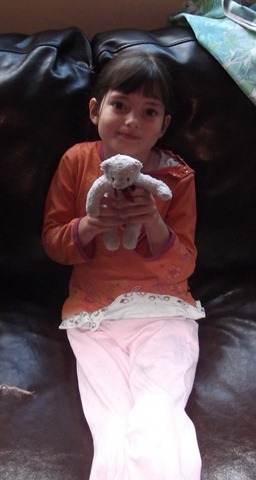 We hope she will be home soon. In between hospital visits, keeping an eye on Dad, unpacking boxes, sorting out the van, catching up with a few friends and family, life has been a tad busy! I managed to get along to an Altrusa meeting on Monday night and was very warmly greeted. It was lovely to see all those familiar faces, although it was not so good to hear of illness amongst members and a recent death. We also managed to get to the Quiz on Wednesday night at Fat Sally’s, and came away with a win! I have even managed to sneak in some watching of the ANZ Netball games. All in all a busy old time. Who said retirement would be dull and boring? 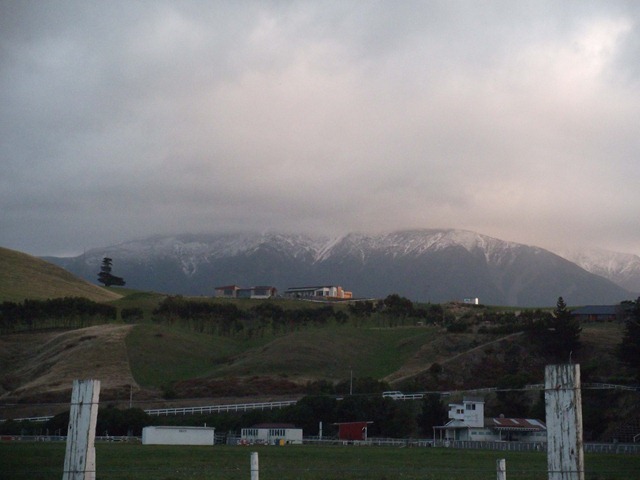 Snow on the Kaikoura ranges. Today we headed off to Christchurch and a business meeting. 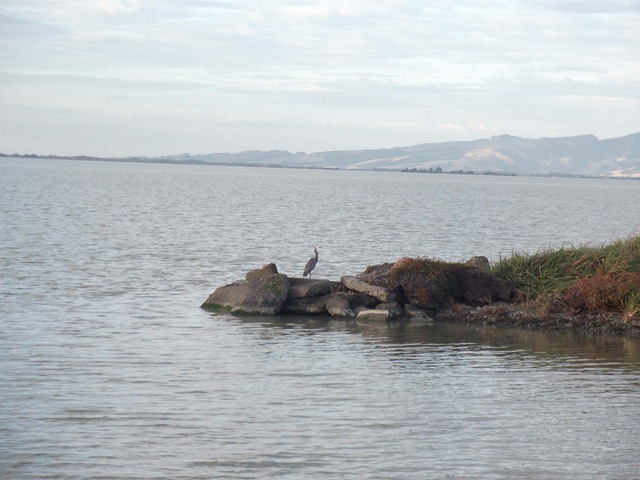 We made a couple of stops along the way to either see clients of Roy or for a rest stop. We made it through the outskirts of Christchurch, only seeing some small evidence of the earthquake as we kept well away from the central city area. That attended to, we made our way to Lake Ellsemere for the evening and a lovely spot with 3 other large motorhomes in residence, right on the edge of the Lake. Today was off to Ashburton to visit with Jason & Erica and our 4 grandchildren. But first we had a few chores to tend to in Ashburton itself, the main one being getting some keys cut as we only had one key to open all the lockers. we also visited a motorhome refit business to get some idea if what we were wanting to get done in the van is at all feasible, possible and achievable. That done as well as a bit of shopping done we headed off out of Ashburton to Eiffelton. We arrived to find all the family fit, well and happy, although the children seem to have sprouted in the 8 months we have been away. 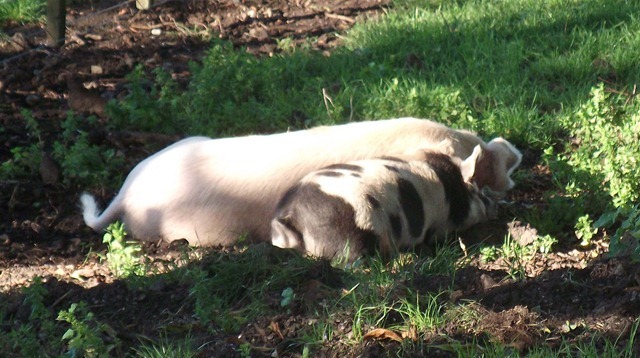 Jason & Erica have a lovely property with a few acres that they are planting with lots of fruit trees, they already have 10 chickens and 2 Kuni kuni pigs. And at last Snow is at home. It also just so happened that friends Anne & Paul were heading form Christchurch south so they called in to say hello, and hatch some plans to meet up with them and surprise other friends over the weekend. Roy was very cheeky and gave Anne all our washing to take home so we could collect it tomorrow when we called in! Anne & Paul continued on their way south and we continued to enjoy the family. Lots of catching up done, lots of playing and reading to the children and then it was time for bed. Dante off to school, Jason off to work/school, Erica with Rose, Theo and Andre off to Playcentre, we headed on our way south with promises to return in a week or two in time for Andre’s 1st birthday and also to spend lots more time with them. 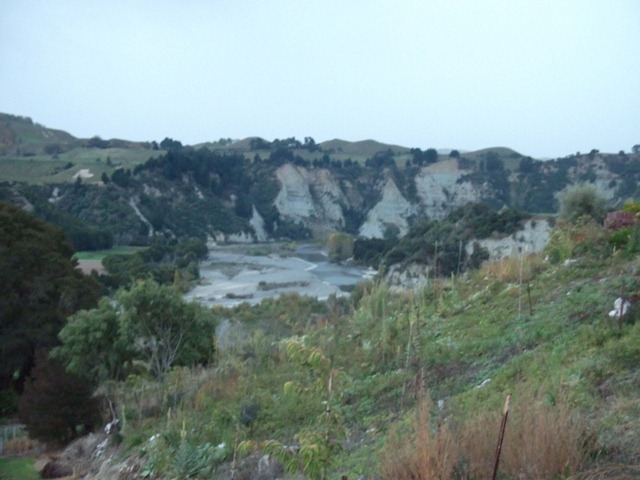 Next stop Timaru for a dump of waste and collect water, then off to Hook and to Anne & Paul’s. A very pleasant time was had, catching up with Sandra & Barry and Bridgette as well, finish the washing, talking, eating, cooking and playing cards. Time to head off along very familiar roads to Oamaru and to Mum & Dad’s. We took them for a quick ride in the van around to Mike & Ann’s which is where we have all our gear stored for the van. Again lots of catching up, before Mum & dad were dropped back to their home, and Roy & Bernice set to opening up boxes that they had put aside in readiness to load the van. It was a little like Christmas opening the cartons, except we now realise that a lot of the items that we had deemed “essential” motorhome items are of course not required or needed. A major cull will take place over the next few days of sorting and repacking. Then of course this week our cartons that we sent from the UK are due to arrive so more “necessities” will be found ! In the meantime, we are parked up in Mike & Ann’s driveway, although we are now staying in their home until we get sorted. Then comes the planning of the next month or two. Oh, we have not mentioned previously that we will be house-sitting back at Pen-y-bryn for the months of June and half of July, then we are house-sitting Helen & Don’s hazelnut farm from mid July through to the end of August. 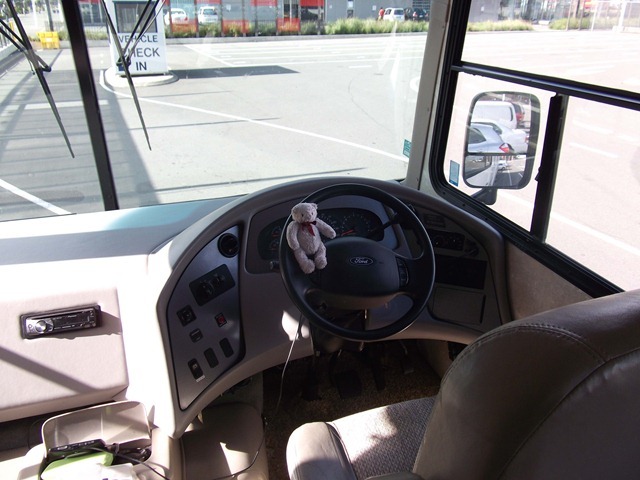 This will be the perfect time to attend to the changes and reconfigurations we want to make to the motorhome. Oh and in the middle of all this Bernice will be off to Singapore to meet up with Alex for the World Netball Champs followed be a few days relaxation in Bali! Bring it on! Woke to a lovely morning at the golf course. Wandered along the first couple of fairways and looked over the edge to the lower part of the course. 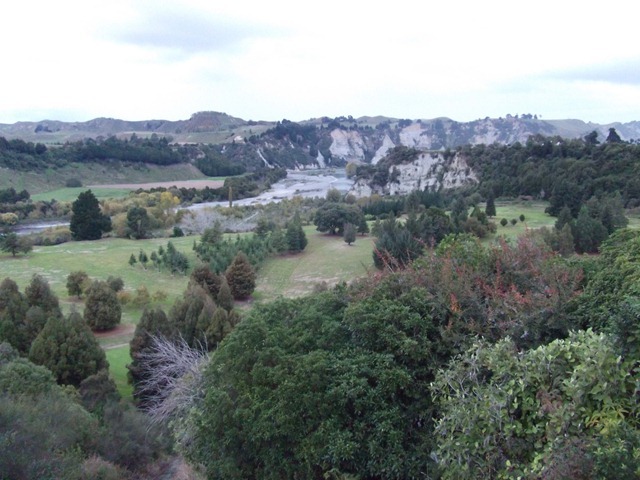 Looking from the top level of the course over the Rangitikei River. And here is how to get there using the cable way!! Left the Rangatira Golf Course and headed south. First stop was Marton to dump the waste before continuing on our journey. We stopped for lunch along the way, not quite sure where we were but it was around Paraparaumu somewhere. Who said New Zealand was not a tropical oasis just look at the palm trees. 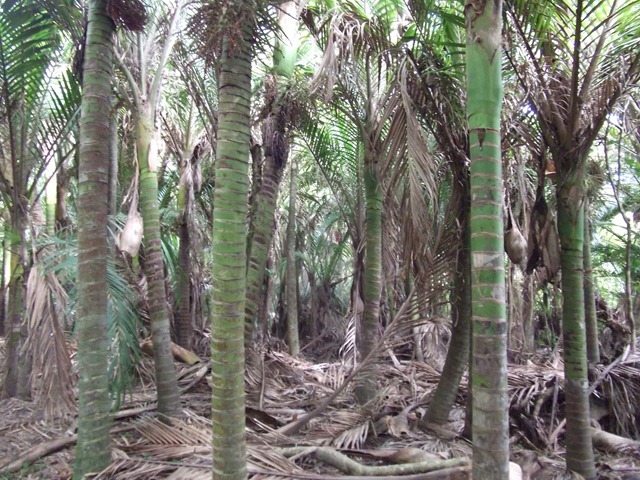 Nikau palms in the reserve alongside where we parked for lunch. Arrived at the Bluebridge Ferry terminal just on 3pm, our sailing was not due until 9pm so a few hours to kill. Roy went walkies whilst Bernice got out the labeller and had a bit of fun reorganising!! Gave the nieces in Wellington a txt to see if we would be able to catch up. Natalie, Richard and Renee came to visit and it was lovely to catch up with them. Unfortunately Amy was working so we were unable to catch up with her. Next time. By early evening the wind had picked up and by the time we were thinking about joining the queue for the ferry, it was well and truly blowing – great, just what we fancied, a rough crossing! Whilst waiting in the queue to board the ship, we were approached by a man who was looking for someone to hitch a ride with. Apparently, with the evening crossings they do not take passengers, only those who are with a vehicle. No skin off our nose, so he joined us for the drive on and off the ship. However, on chatting with him, it turns out that he specialises in converting American vehicles to right hand drive, and had done a number of conversions of the same type of van as ours. This could be a handy person to know! We disembarked after a reasonably uneventful crossing, it was a bit lumpy in the middle of the trip but it was not too bad. Our new friend, Kevin, had also told us that he was passengering back as he had just delivered a motorhome to Rotorua, and he had also driven many vehicles across the USA. We took advantage of his driving skills and he drove our van to his place in Blenheim arriving around 2am. Kevin had invited us in for breakfast as a thank you, and after breakfast it was time to get on the road. Although we would not be travelling far today as Roy had a pile of work to get done. 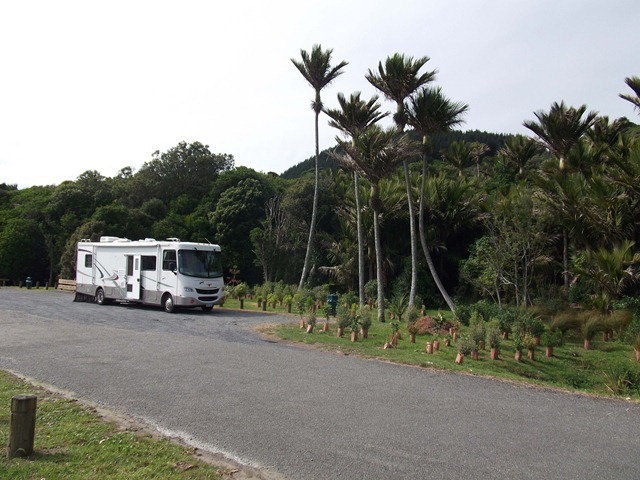 We travelled as far as Kaikoura and found the NZ Motorhome and Caravan Assn parking facility where we were able to top up with water and park quite comfortably for the afternoon. Although it has to be said, we have had to drag our winter woollies out of our bags as it is damn chilly. After the amazing warmth and sunshine we have had for the past two months in the north, it has come as a bit of a shock to the system. 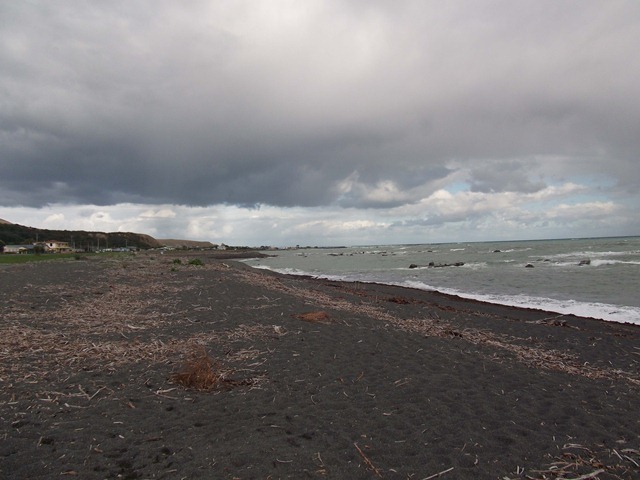 Looking along South Bay north toward Kaikoura under a lowering sky. We intend being in Ashburton by tomorrow evening to spend a few days with the grandchildren before we make the final leg south to Oamaru. Then we will have a van load of gear to try and find a home for. I can see the labeller going into overdrive!! and another garage sale in sight! Oh and for those that have missed him, let us assure you that Snow has been enjoying all the pleasures of being back in New Zealand. and from here, well he is a little large for his bed but it is still comfortable. Snow is looking forward to being reunited with his big “brother” and living in his new home with Rose in Ashburton. Wandered down to Sue & Jeff’s this morning to get stuck into prep in readiness for this afternoons BBQ. That quickly dealt with, it was back to the van where Roy had borrowed, not only a vacuum cleaner, but also a long extension cord to run across the road (from the neighbours no less!) to give the van a clean out. That done, Sue & Bernice tackled cleaning the windows whilst Jason & Karen armed with a screwdriver, took to removing the pelmets and “decorative” curtains. Soon people started arriving to help celebrate Jason’s 40th birthday. People, laughter, drinks, food. However, it was not long before it was time for us to get on the road to keep moving south. Having washed the clothes, washed ourselves, cleaned the van and collected a few goodies from Sue & Jeff, farewells said, we set off for Tokoroa to see friends Mike & Laura. 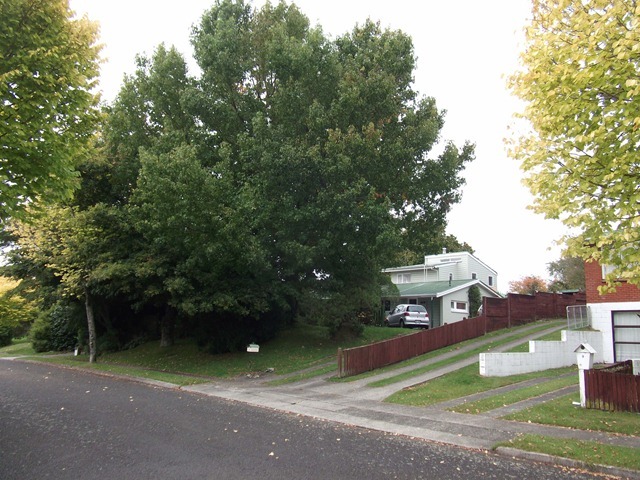 For those of you who do not know us that well, Tokoroa is where Roy & Bernice worked, met, our children were born and lifetime friendships were made. Mike & Laura came to visit us at our parking spot beside Lake Moana Nui where many cups of tea were drunk and lots of talking was done. It never ceases to amaze us how quickly the years melt away. This was only interrupted by a knock at the door, with a couple who just happened to be walking by informing us that where we were parked was not the ideal place to stay the night and told us of more suitable parking. At this stage the lady asked if she knew Bernice as she looked familiar. Names were exchanged, but no pennies dropped, until Bernice mentioned her maiden name which met with the response “oh, are you any relation to John?”, after a positive response, they then asked if I happened to be “Burnie & Hilda’s daughter”……hmmm, talk about being back in a small town! The passersby’s happened to be the Gatenby’s who knew Mum & Dad from their time at Kinloch and boating. A quick catch up, before it was decided to move the van around to Mike & Laura’s and stay there the night. Another trip down memory lane as we headed out to dinner at Alberico’s. Our evening was filled with lots of talk, catching up not only with Mike and Laura but with lots of other diners. We left with a loaf of home made bread – a parting gift from Alberico! Back to home and time to get some sleep. Setting the world to rights, late at night with Mike and Laura. 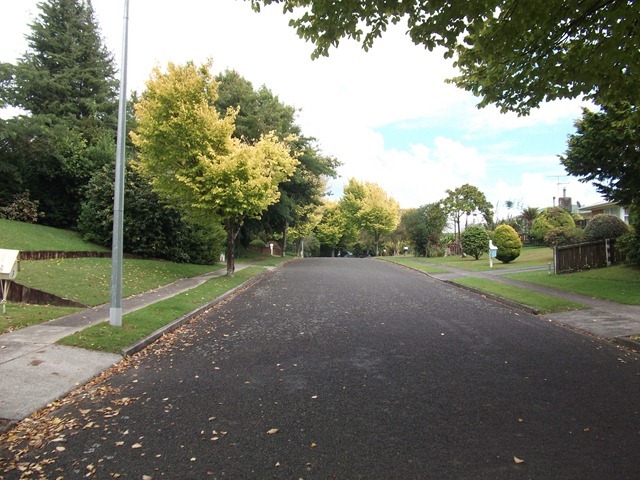 An early morning stroll around the local streets of Tokoroa passed not only a very grown Lake Moana Nui walkway, with evidence of a good population of multiple breeds of water birds, but also a view of our residence in days past. 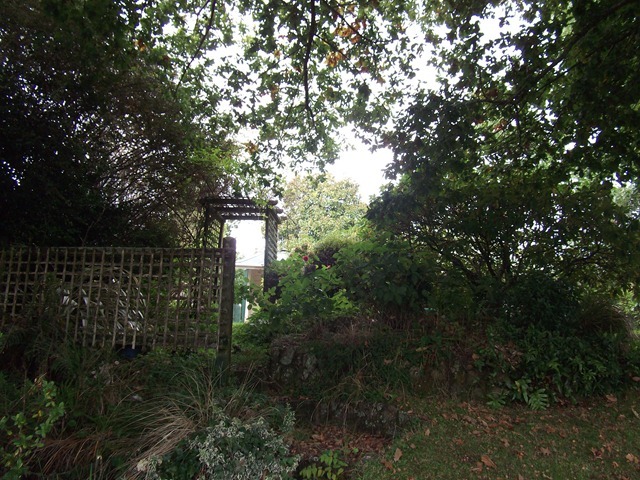 The dingle dell at the front, with the tree house tree in evidence over the top of the house. Laura made us a spectacular breakfast to set us up for the day. Unfortunately it was soon time to say farewell, and continue our journey south. Next stop Taupo to meet with Bernice’s sister Hilary. 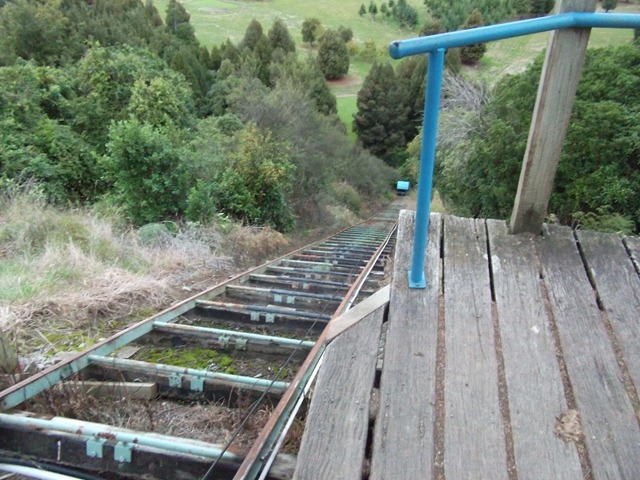 The trip was made along all too familiar roads until we got to Wairakei, where there is now a viaduct past the prawn farm and then encircles Taupo negating the need to twist our way through the township. 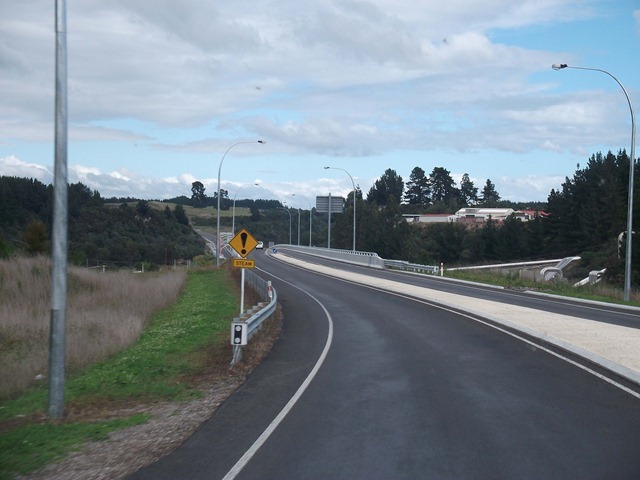 The beginning of the diversion road around Taupo. 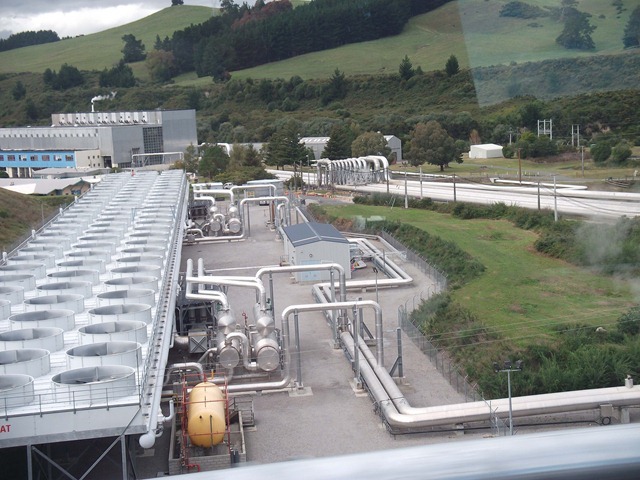 Looking down on the cooling towers of the original Wairakei geothermal power station. We met with Hilary at 2 Mile Bay, she came bearing gifts of home made bread and home grown veg. More cups of tea, and then it was time again to head off. Next stop Motuopa at the southern end of Lake Taupo for a quick stop to say hi to friend Nolene and more catching up. However an unusual incident on the way caused some concern. As we were driving through one of the many small settlements along side the lake there came a rather loud bang. 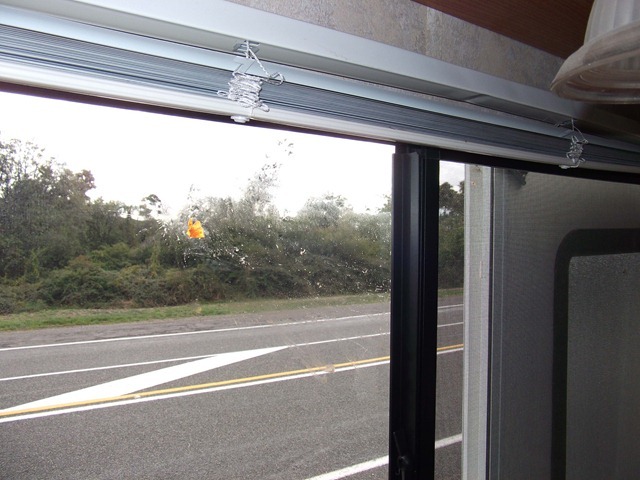 After some seconds we figured that we had been hit (actually it was the motorhome that was hit) by a tomato. Now either they have grown a breed of tomato that literally leaps off the vine when a known tomato addict passes or someone decided to have some target practice at passing vehicles. Fortunately nothing was broken and no one hurt, but if it happened to a passing tourist it would not be a particularly good advertisement for New Zealand!!! 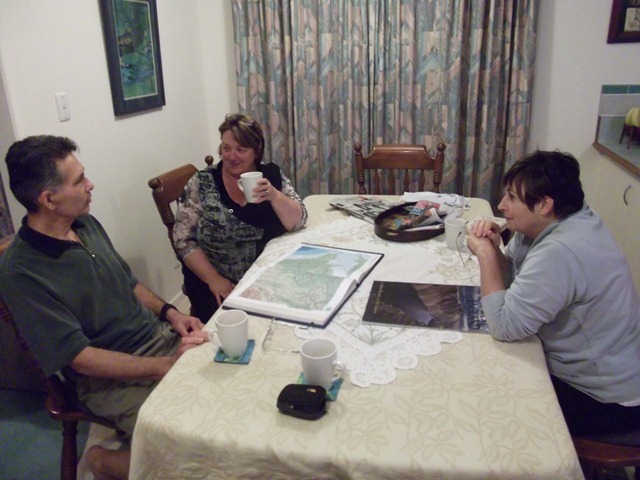 Spent some time talking to Nolene and again the smallness of New Zealand was illustrated. It turns out that the man we bought the motorhome from was the son of one of Nolene’s best friends from school days with whom she keeps in touch. Off through the Desert Road and to find somewhere to stay the night. A quick check online and we came up with a few options, starting with the Dump Station at Taihape (overfull so of no use to anyone); free parking in Taihape (looked all around for the place but could not find it) ; Oh well better luck in Mangaweka, No!! again could not find designated parking. Finally headed for the Rangatira Golf Club, quickly found, finally parked up for the night. Now for those of you who are wondering how our new electric systems are working, we can tell you that all systems are working fantastically. We have more power than we know what to do with. We get up to over 100% full power each day from the solar and after using most appliances we have not managed to reduce the power levels to below 80%. Great stuff. 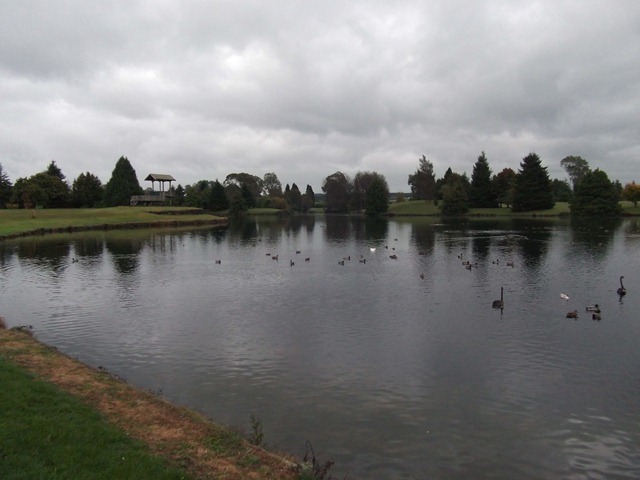 Ambury Park in Mangere, who would have thought that it was such a lovely spot to stay, and who would have thought that we were right in the middle of Auckland City? 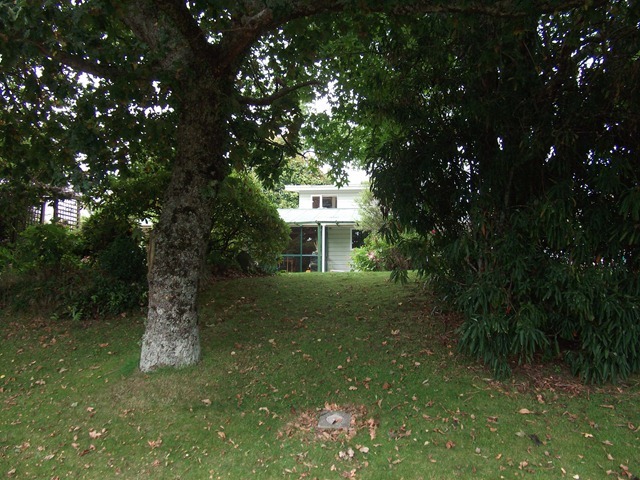 Thanks to the foresight of past ARA personnel Auckland has a magnificent collection of properties which they have developed into great facilities for the use of locals and visitors. I would particularly recommend Ambury to parents and grandparents. The whole facility is set up to introduce children to various farm animals. 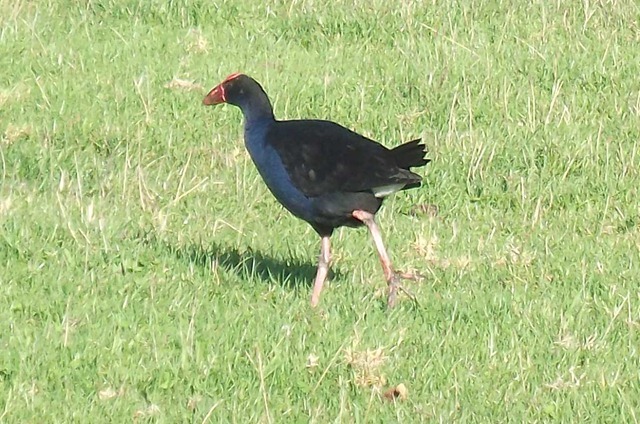 Within a limited area they have Cows, a number of different breeds of Sheep, different breeds of Pigs, Rabbits, and a very large population of Pukekos andd other native birds wandering free. They also have demonstrations of milking and shearing. For motor homers it provides an excellent point to start a visit to Auckland, or a last stop before heading North or South. It is literally a short distance from the motorway and you get a very straight run right through to the North or South of Auckland. We took off to the South. We had tried to contact friends Wade & Lindsay who live in Hamilton but received no reply, so the GPS was set for Putaruru to Bernice’s sister Sue. 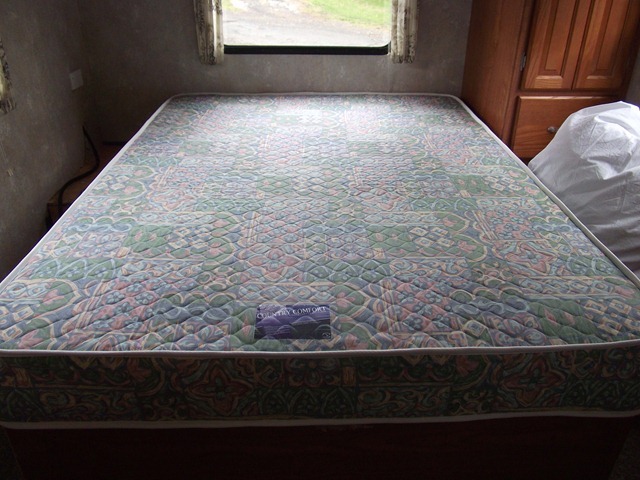 Along the way, Bernice thought that it might be a good idea to call the people who made the mattress for our bed and see if we could possibly get a queen sized one to replace the king sized one we had. A quick call to Waikato Bedding and a short diversion was made to the factory in Hillcrest. A very pleasant gentleman came to look at the van and measure up the bed. He told us that he could either make us a mattress to fit or he could remodel the one we already have by trimming it to size and if we waited he could have it done in under 2 hours!!! What service. What is more, the cabinet makers would remove the extra bits of timber and make it all presentable. These efficient men had it all done and we were on our way in under one hour. Amazing, friendly and fantastic service! 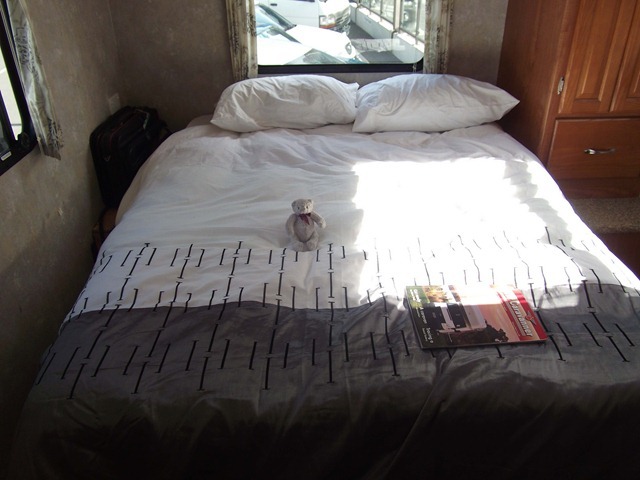 We can highly recommend Waikato Bedding for fantastic service and products. The new (remodelled) mattress in place, Room at last on both sides of the bed. Whilst we were there, Wade called to say he had received our message, and so he called round to see us. After a lovely catch up, we were on the road again and headed for Putaruru, an uneventful trip we arrived and parked up opposite Sue & Jeff’s.